Brisket, potato salad and coleslaw. If you don't like onion don't worry. I added myself from the condiment table. 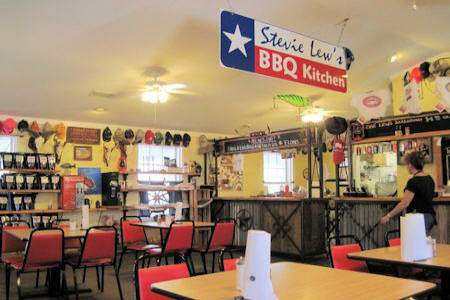 Stevie Lew's BBQ Kitchen is a family place run by a family…literally. It appears that everybody in the Meinhausen family is involved. It really doesn't take that much to figure it out. Right at the door there is a whole family of footprints pressed into what was once fresh concrete. Once inside it looked like mom, son and daughter were in the kitchen working while another daughter was out front to take our order, all with a smile. The menu included Chicken, Sausage, Brisket, Pork Ribs, and something you don't see in many Texas Barbeque places, Pulled Pork. Sides included potato salad, creamed corn, cowboy beans and coleslaw. Hold it! I'm getting hungry! There is more on the menu but I'll leave it at that. Well they do have Bluebell ice cream. 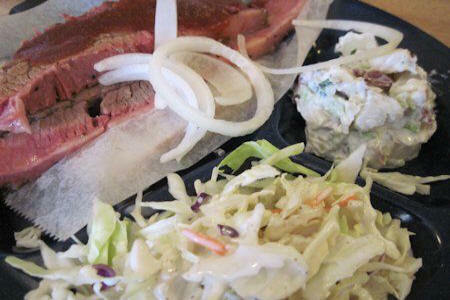 I ordered brisket, potato salad and coleslaw. My wife ordered brisket and chicken with coleslaw and creamed corn. I have to confess when I saw how pink the brisket was I thought it might be under cooked for me, but I was wrong. It was perfect and slow cooked to perfection. I also need to comment on the coleslaw. This coleslaw was obviously handmade not processed with a machine. I'm not saying it was torn apart with their fingers, just that it was hand cut and mixed. After finishing our meal we considered ordering some cobbler with a scoop of Blue Bell ice cream on top, but since we are trying to watch what we eat we decide to just have some vanilla Blue Bell alone. As we left the young lady that had be taking care of our every need was busy taking an order from another customer. When we about half way to our vehicle she came out the door and tank us for coming in. 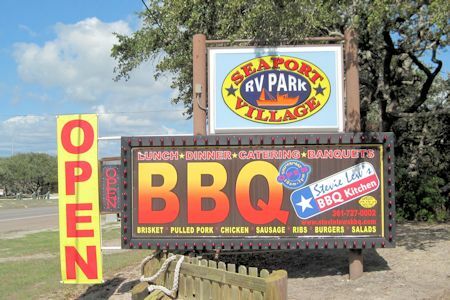 Did I mention that Stevie Lew's BBQ Kitchen is at the front of Seaport Village RV park also run by the Meinhausen family? These folks are busy! Maybe will come back sometime and stay at the RV park, eat barbeque and eat bluebell.